As a scribe of the Plastic Minis Kingdom, I, Philotep, will record on these scrolls every task performed every year in order to complete the great works of the plastic realm. Today, I wish to start a series of posts related to the Confrontation miniatures range by Rackham. I wrote last month (see here) how I got inspired by one of the factions to convert a 1/72 mini into a Wolfen. 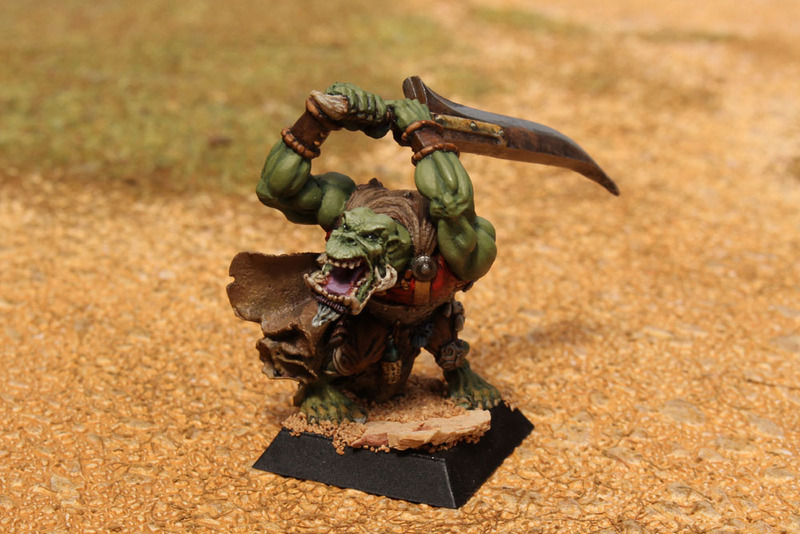 What I didn't explain was that I painted dozens of these minis some years ago, and I think it's time to display some of them on this blog, even if they are not 1/72. 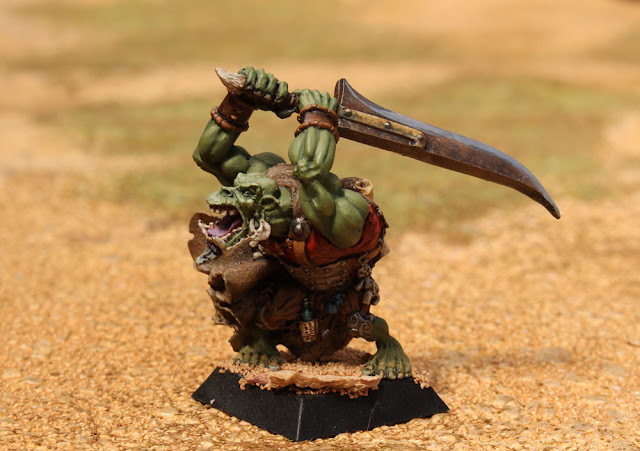 The first mini to show is an orc warrior. In the universe of the Confrontation game, they are called the Orcs of Bran-o-kor, and they live in the borders of the Syharhalna desert where they were former slaves to the Scorpions of Dirz. I used a classical green color for this orc (that's why my 1/72 orcs are painted in another color, I wanted to change :)). His tunic is red simply because red and green are complementary colors. The base is very simple, it is meant to recall that this guy is living in a desert. In my eyes, the Rackham minis remain the best fantasy figures ever created. 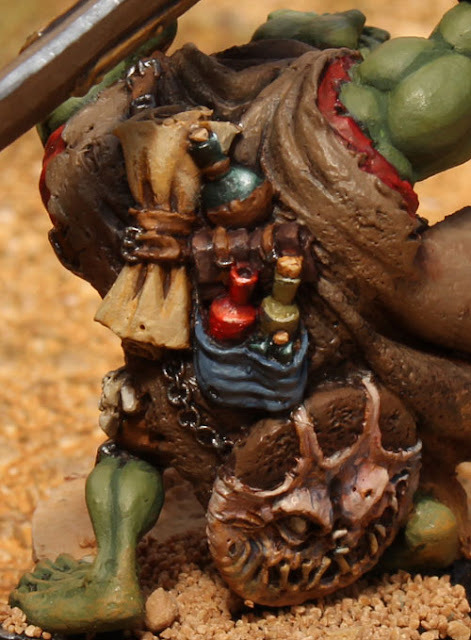 They are famous for the incredible level of detail which make them more difficult to paint than others. You can see several flasks and bottles, a book, a scroll and a scary shield (there are often humoristic details in this range :)). What do you think ? Would you be interested in seeing more of this range, or will you ask to remain in the one true scale :) ? Hope you like this giant anyway. See you soon. Oooooh thats a cool mini!!. The rackham range are fantastic, so much detail and movement. It would be great to see more. Are you planning to use them with the 1:72 minis for fantasy gaming?. Thank you Sprinks. No, I don't think that they will be giants en 1/72, the sculpture is too different IMO. 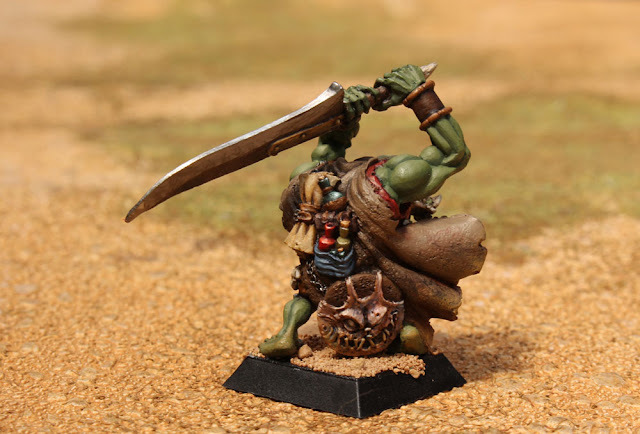 I'd rather use Fantasy toy soldiers (if I could find some), or Boardgame minis such as Zombicide Black Plague minis - I have a post in preparation on the subject. Beautiful painting of a very nice figure. Kula Shaker - cool. I only have K (1996) and don't know the more recent work. Thank you Maudlin! I first listened to K also, excellent record, with some reference to Grateful Dead. K is a great album, but Pilgrim's Progress is even better !! Beautiful brushwork on an ugly character!